Meet Me There weekender returns for our second edition! A unique celebration of Ghanaian culture through music, arts and workshops. Bringing like-minded individuals together for a unique celebration of Ghanaian culture, MMT Weekender offers a festival experience like no other. Our four-day programme is designed to open your eyes to the magic of Ghana through a carefully-curated display of Music, Arts and Culture. From traditional percussive sounds to new school Afrobeats and highlife, our lineup promotes some of the finest Ghanaian acts as well as our favourite DJs from across the globe. Despite music being such an integral part of everyday Ghanaian life, there is little opportunity for local budding musicians to pursue their talent. We are proud to provide local artists with a platform to perform their work. But MMT Weekender is not just about the music. We’re delighted to present a diverse programme that showcases the rich cultural heritage Ghana is blessed with. 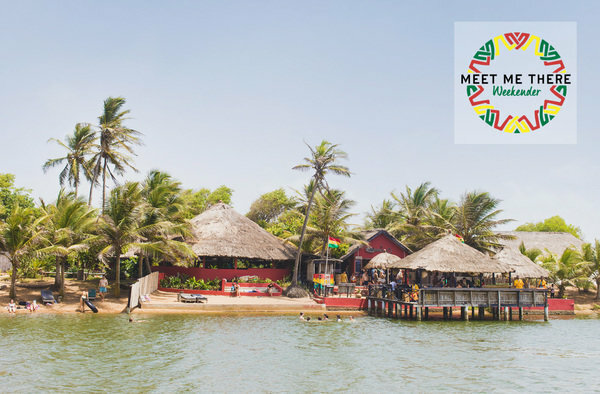 Featuring daily traditional cultural performances by local schools, graffiti collaborations between Ghanaian and international artists and a main stage decked out with vibrant hand-woven prints, the site is bursting with creativity. We also offer free workshops and activities for all ticket holders throughout the weekend. Whether it’s trying your hand at Batik printing, getting stuck into a beach football tournament with the locals or joining a boat trip down the Volta River, there’s something for everyone. MMT Weekender is more than just a festival. Our mission is to give you an unforgettable insight into Ghanaian culture whilst also raising vital funds for the work of our NGO Dream Big Ghana. Last year’s festival raised over £6,000 for our charity, which brings life-saving sanitation and life-changing educational opportunities to local villages Dzita and Dzita-Agbledomi. Current programmes include female hygiene, ecological sanitation (both at school and home) and adult literacy. To find out more please follow them on Facebook or sign up here for all their latest news. Limited amount of accommodation is available on site and is booked on a first come first served basis. Off site accommodation is a 15-30 minute taxi ride away. There will be a variety of different styles for accommodation. Ranging from tented options to AC rooms. Please contact us to find out more about accommodation. Boat trips, beach parties, Beach football tournaments! We're Proud to host our tickets on Party For The People. Party For The People is a UK based social enterprise and online ticketing platform, set out to raise funds for charities all over the world in collaboration with events and festivals. They use the profits from booking fees to support those in need. Dream Big Ghana, is a UK registered charity, the mission of Dream Big Ghana NGO is to work with the village communities of Dzita and Agbledomi on sanitation, healthcare, education and youth sports development projects. The NGO provides practical volunteering opportunities for people from the UK and elsewhere. The NGO also organises elective placements for healthcare students. To date there have been 80 toilets built, benefiting around 2000 people.